1. Use a julienne peeler to shred the courgettes (or cut them into fi ne matchsticks). Put 1 tbsp olive oil in a large frying pan over a medium heat. Add the pumpkin seeds and stir-fry for 1 minute, until turning golden. 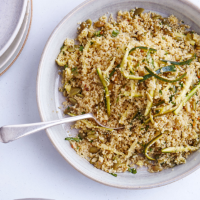 Add the garlic and coriander seeds to the pan, cook for 30 seconds, then add the courgettes and lemon zest and stir-fry for a further minute – the courgettes will not be cooked through. Remove from the heat and stir in the lemon juice and remaining 2 tbsp oil. 2. Meanwhile, bring the stock to the boil. Put the couscous in a heatproof bowl, pour over the stock, cover with a plate and set aside for 10 minutes. Fluff up with a fork, fold through the courgette mixture and chopped coriander, then serve.